Gisele Bündchen is a South American model who had stellar modeling career that began just when she was fourteen years old. The Brazilian model is also an accomplished businesswoman, author, and wife of the New England Patriots quarterback, Tom Brady. The mother of two has graced notable fashion magazine covers and walked famous runways as well as sold out products she became ambassadors for. Here’s her bio, age, actual height, family among others of the trailblazer. Gisele Caroline Bündchen was born in Horizontina, Rio Grande Do Sul, Brazil, on July 20th, 1980 to Brazilian parents – Vania Nonnenmacher and Valdr Bundchen. Her mother worked in a bank as a clerk while her father was a writer and professor at a University. At the age of thirteen, Gisele Bündchen and her two sisters – Patricia and Gabriela, were enrolled in a modeling institute by their mother who foresaw the talents her teenage girls had. A year on, while on a school excursion, Gisele was spotted in Sao Paulo by a scouting agent who immediately extended an invitation to her – she was fourteen years old at the time. Grabbing the opportunity to work with Elite modeling agency with both hands, Gisele Bündchen soon started making waves in the industry. Her first time on the runway was for a national modeling contest – Elite Look of the Year, where she placed second. She would go on to appear in the global modeling competition, Elite Model Look in Ibiza, Spain and finished in the fourth position. Two years after, in 1996, she earned a slot in the New York Fashion Week runway and she did not disappoint as she won a lot of admiration for a job well done. From then on, she quickly hit big gigs, gracing the covers of notable magazines like Vogue, Elle, The Rolling Stone Magazine, Allure, Sports Illustrated Swimsuits, Vanity Fair among many others. Her exploits in the world of showbiz were not limited to modeling as she made her acting debut in 2004 when she appeared in the comedy film Taxi as Vanessa alongside famous TV personalities such as Queen Latifah and Jimmy Fallon. Her other works include The Devil Wears Prada, Tom Vs Time – her husband’s documentary film. Gise, as she is fondly called, is not just beautiful but has also got business brains. She is the proud owner of the Organic skin care product line known as Sejaa as well as a lingerie and footwear line. Bündchen also owns the luxurious hotel, Palladium Executive. As an author, she has written a book titled Lessons: My Path To A Meaningful Life. She is a philanthropist par excellence; her neck piece designs were used to raise funds for victims of the Haiti disaster in 2010. Asides that, she had been an active supporter of Save The Children, Doctors Without Borders charities among others. The beautiful model is also the United Nation’s Goodwill ambassador for a sustainable environment. The model has not only broken records over the course of her career but has also earned fat cheques for her efforts. Her current net worth is pegged at $400 million with a yearly income flow estimated at $40 million per annum. Collectively with her spouse, Tom Brady, they have a powerful net worth of $580 million. Gisele Bündchen was not born as an only child, as she has other siblings with whom she was raised. They include; Gabriela, Raquel, Rafaela, Graziela, and Patricia, a twin sister who was birthed five minutes after she was born. They are not identical by any means as they are fraternal twins. The Harvard Medical School award winner of 2011, has been happily married to the No. 12 man of New England Patriots, Tom Brady since February 2009. The couple had a second ceremony, sometime in April 2009 in Costa Rica, to enable their families share in their joy. They have two beautiful kids together, who are Benjamin Rein and Vivian Lake, born on 8th December 2009 and 5th December 2012 respectively. 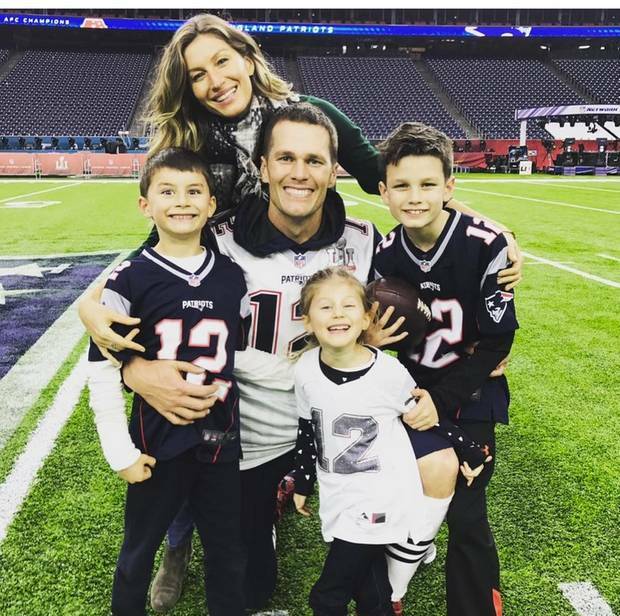 She is also a stepmom to Jack, Tom Brady’s first child with Bridget Moynahan, an actress noted for her roles in Blue Bloods. Gisele Bündchen has been in other romantic relationships before she settled down with the father of her children. Some of the men she had been linked with include Joao Paulo Diniz, Leonardo DiCaprio, Chris Evans, and even Kelly Slater. Tom Brady who was born as Thomas Edward Patrick Brady Jr is a native of San Mateo, California. He is one of the finest and oldest quarterbacks in the history of the National Football League (NFL) and has broken several records with the New England Patriots who drafted him in 2000. Brady has won six Superbowl championships and was voted as the MVP (Most Valuable Player) of the bowl four different times. He is no doubt, a smart, hard-working, instinctive and dependable player in NFL, no wonder he has had fourteen times Pro Bowl mention. His strict regimented exercise routine coupled with a healthy diet specifically formulated for him, all accounts to his overall success as an athlete. The elegant Southern American blue-eyed model, no doubt has one of the knock-out bodies in the modeling industry. Her steps are laced with unusual grace which sets her apart from others on the runway; no wonder she was highly sought after. The mother of two has an athletic build, commanding a height 5 feet 11 inches (1.80m). Her frame is neatly balanced by a weight measured at 60 kgs (132 lb) while her other body parts are reported as 35-23-35 inches for breast, waist, and hips respectively.